As you will know if you check out my previous post I think Paul J. Silvia’s book ‘How to Write a Lot’ is an excellent resource. However, there are at least three points (perhaps minor) on which Silvia and I disagree. 1. Making and sticking to writing times is very important. That said, I think that graduate students need to be flexible. I schedule meetings with professors around my writing time when I can, but if a professor only has a certain slot available I think it is important to be able to move my writing time to an hour later. On a related point, in the name of terseness I said in my last post that my writing times were M, W, F from 1-3pm. In truth, I had to accommodate my teaching schedule. On Mondays I taught at Hunter College from 10:10 – 1pm. After class I needed to get food, and then there was not really a good place for me to work at Hunter – so I commuted home, and then I usually had to walk Boomer. My writing time on Mondays had to be moved to 3-5pm. What is most important, and Silvia stresses this, is that the writing time is a consistent time that you can work well and focus on your research. Two of these next points concern the physical surroundings that Silvia maintains are necessary for writing. 2. Silvia makes light of working in his living room, bedroom, guest bedroom and “briefly in a bathroom” (p. 21). He then concedes that he wrote ‘How to Write a Lot” in the guest bedroom in his house. I agree with Silvia’s larger point – you don’t need a home office to write a lot; but I think that a guest bedroom is a nice luxury not afforded to many grad students, especially those of us in NYC. I would amend Sivlia’s point. You don’t need a home office, but it is useful to have a place where you consistently write. For example, I write at my kitchen table. I stack up a bunch of Developmental Psychology issues so the laptop is eye level, and I don’t strain my neck (yes it’s happened), and then I plug in a USB mouse and keyboard. I call this space my ‘office’, and when my writing time is up – I put my office away (Or my wife gently reminds me to do so when she gets home). I think having this regular space is important, it adds to my routine and cuts out the ten or more minutes I might waste trying to settle down elsewhere. Of course some days I am at school – so I just use the desktops there and that works fine too. 3. Finally, Silvia claims you do not need a comfortable chair. I disagree. You don’t need to spend thousands of dollars on a chair, but your chair should be comfortable and supportive. 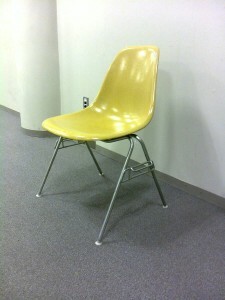 Silvia says he worked on a metal folding chair and an Eames fiberglass chair. Perhaps that worked for him but I could not sit on one of those chairs for 6- 10 hours a week. As Chuck Close says, “How’s the back?”.
!) If you’ve ever watched the show ‘House’, you might remember Dr. House and his team would regularly hold meetings in various sections of the hospital. Even the morgue! The claim? Different surroundings can spur various thought processes. @) Have you ever tried working while sitting on one of those pilate balls? #) Just realized I kept holding shift while hitting the numbers on my keyboard. And those are my # (3) points of contention for u! Kristin Monaghan on Banana Spiders in My NY Kitchen! p on Who is the Audience? Saaj on Who is the Audience? My First First Author Peer Reviewed Paper!